Found in numerous areas throughout the game, a Titanite Demon is an intimidating foe that often guards valuable items or important areas. It is also one of the few sources of rare Demon Titanite for weapons upgrades. It attacks by swinging its Titanite Catch Pole or, if at a distance, it fires powerful long range lightning bolts. 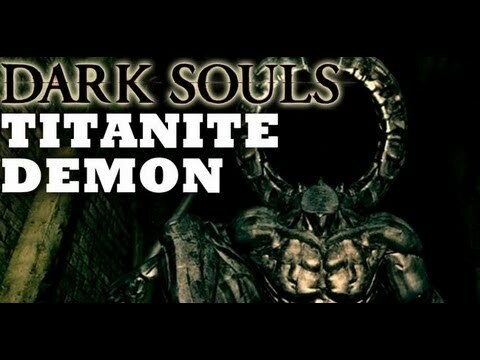 As the name suggests, the Titanite Catch Pole can in rare instances be used by the demon to grab and pin the player for high or sometimes fatal damage. Players can take advantage of its slow turning speed to attack it from behind; however they must still be wary of its jumping pounds and tail sweeps. Although all Titanite Demons look the same, some are more powerful than others so managing to kill one does not necessarily mean you are prepared to face all of them. While the Titanite Demon's lightning bolt attacks will be blocked by obstacles, its catch pole will clip through walls and obstacles making it dangerous even if you are behind cover. The Prowling Demons, also known as the Titanite Demons, are demons born from the scattered Legendary Slabs after the unnamed blacksmith deity passed away. They wield the Titanite Catch Pole which still has residual power from the Titanite Slab from when they are spawned. Sen's fortress, in the open pit under the first set of swinging blades. A total of 4 Titanite Demons reside in the area so be prepared. Titanite Demons are weak to weapons imbued with lightning, either elemental or Gold Pine Resin. Lightning spear miracles are also very effective, and the player may time his or her attack by beginning the lightning spear cast while still behind cover, and then stepping out just in time to throw the spear before retreating again. Certain other viable tactics are specific to individual Titanite Demons. When fighting Titanite Demons in Sen's Fortress, a Rusted Iron Ring is highly recommended as movement without one is extremely slow. When fighting the demon in the lower room near Blacksmith Andrei, it may be lured to the top of the lower stairs to render its horizontal pole sweeps useless, or it may be killed with arrows from behind one of the broken pillars in the room or from the trees outside. The demon in Anor Londo may be shot with arrows from the upper balcony in the room. The demon in Lost Izalith may be shot with arrows from behind in the tail if the player approaches through the Chaos Servant shortcut. The demon in the Catacombs may also be attacked from behind various points of cover in the hallway, including pillars and coffins. It is also possible to kill them with arrows, using debris to block their lightning attacks. A long range bow such as the Black Bow of Pharis combined with the Hawk Ring and/or Feather Arrows also makes it possible to repeatedly shoot Titanite Demons from just beyond their aggro range. This is easier if one targets a limb (such as the extended leg) or, if behind the demon, its tail. Arrows can also occasionally stagger a Titanite Demon, although it does not have a head to target for bleeding headwounds. 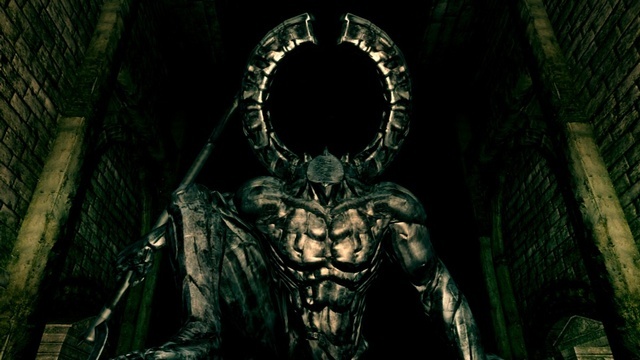 For a melee fighter, the best way to approach any Titanite Demon is to position yourself behind its free arm, where it appears to be missing a leg. Although this position can be hard to maintain due to its jumping attacks, while here all of its attacks will miss you and you can score an easy hit or two. This strategy takes time, but you will eventually prevail. Combine with Gold Pine Resin for best results. A high stability shield such as the Eagle Shield can be very helpful against the demon's horizontal sweep attacks, blocking in between its horizontal sweeping attacks. Remember to circle around it, movement is crucial. It is advisable to back up if the demon leaps in the air, as its landing attacks may circumvent the player's blocking or pin the player. Many pyromancies such as the various fireball pyromancies or Fire Whip are also extremely effective against the Titanite Demon.